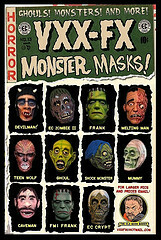 these masks are awesome , thx to jeff Rassier for point'n them out to me . battle royal babes art show sneak peeeeeek! cats fantasy dragons & BATs oh my..